The Biotechnology Research Institute (BRI) in one of the institutes established under the KALRO Act 2013 to undertake research that would generate and promote agricultural biotechnology knowledge, information and technologies that respond to clients' demands and opportunities. Kenya is an agro based country; therefore BRI will work with county governments and other stakeholders, to sustainably exploit the country resources to make new products or provide new methods of production using modern biotechnology. This is in line with the National Biotechnology Development Policy (2006) that recognized that biotechnology requires a close working relationship with multiple stakeholders. 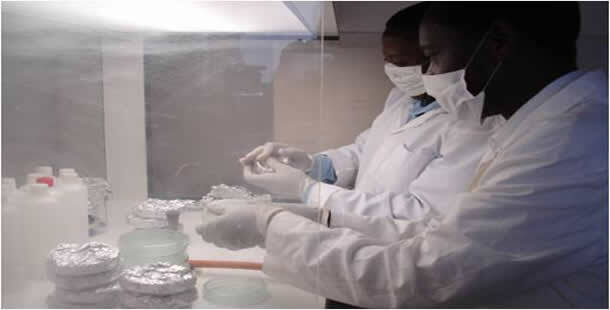 The Biotechnology Research Institute is situated at the Muguga KALRO Campus (formerly KARI-TRC; KETRI) in Kiambu County. It integrates all research activities of the the former TRC, Muguga and the Biotechnology Research Centre, Kabete along Waiyaki Highway. The headquarters in Muguga is approximately 40 km from Nairobi, off Nakuru-Nairobi Highway in an environment that is conducive for research and training. 3. To facilitate and advocate policy options for enhancing demand-driven agricultural biotechnology value chains research. 5. To enhance availability of knowledge, information, and technologies on agricultural biotechnology value chain research.